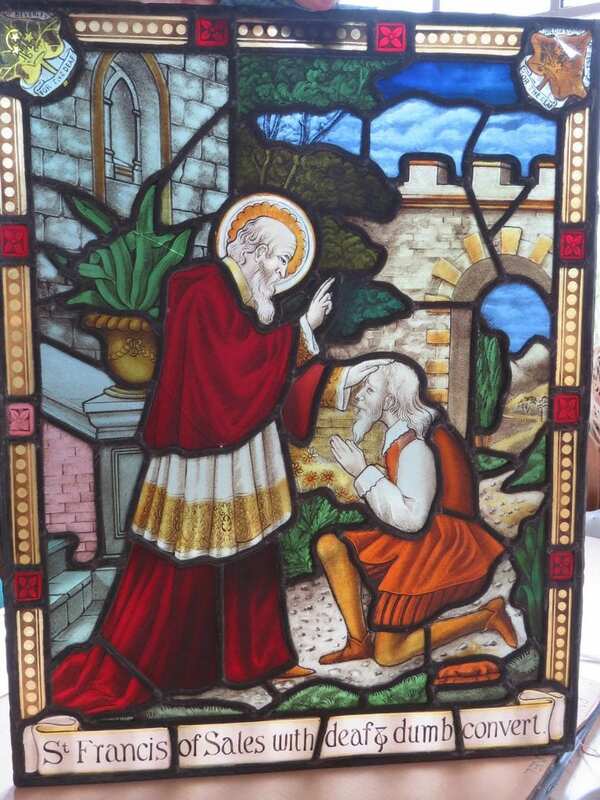 In our collection of artifacts, we have, bizarrely, three stained glass windows. The windows were placed at 5 Grange Road, Ephphatha House, where Selwyn and Kate Oxley moved to when they got married in 1929. Oxley’s mother bought the house on his behalf, originally as a home for the library of the Guild of St. John of Beverley. The Guild deserves an entry of its own on the blog, for it was a repeating theme in Oxley’s life, & before his time it had its beginnings in the North of England with Ernest Abrahams and George Stephenson, among others. When Oxley discovered it he seems to have taken it over, and as he wife mentions several times in her biography of him, Man with a Mission, he loved ceremonies and the associated ‘dressing up.’ Essentially it was a religious organisation, that particularly in the early years of the century, involved a sort of pilgrimage to Beverley, or at least annual services commemorating him and his ‘miracle’ healing a deaf man. a Hard of Hearing man, who had been in the employment of Messrs. Ward and Hughes of 67 Frith Street, Soho, above whose works the National Institute for the Deaf had at one time rented offices. 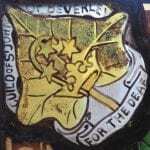 This firm had done work in All Saints’ Church, Petersham, Surrey, under the Vicariate of the late Rev. W.H. Oxley, and this was the last bit of work done by them as a firm, as soon after they suspended business. 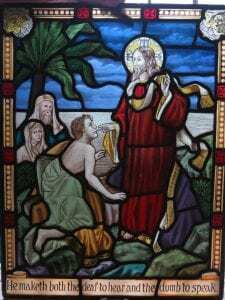 The panels themselves are a work of art, depicting Our Lord healing the Deaf Man, and are flanked on each side by scenes portraying the miracles of St. John of Beverley and Francis of Sales. The colours blended with a simple but strikingly effective beauty, especially when the rays of the sun caught them. 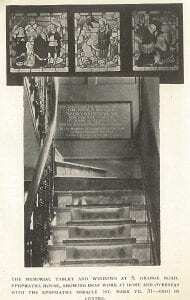 They were unveiled in situ on the staircase by the Guild Warden, the Rev. W. Raper, ‘in his robes of office, carried the business through with a grave dignity’ (K. Oxley, 1953). I have chosen the two smaller ones to photograph, as the St. John one is rather larger & harder to get out. They were not in place too long before the Oxleys moved out of London. I suppose that they came to us from Kate Oxley. UCL has had an association with the RNID/Action on Hearing Loss Library since the early 1990s when the library moved into the Royal National Throat Nose and Ear Hospital alongside the then Institute of Laryngology Library. However there is a much older association between UCL and what was then the NID. War time developments in electronics ushered in an era when mass hearing aids would be small enough to be convenient to carry around, and cheap enough for the state to introduce the Medresco hearing aid supplied by the new NHS from 1948. The previous year the transistor had been unveiled by Bell labs in the US, an invention that would change the world. 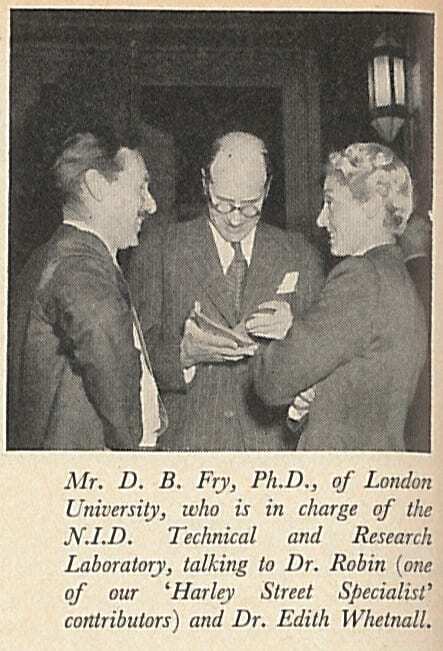 In 1947 The NID set up a technical department, at the behest of the Medical Committee (Annual Report, 1947 p.9). 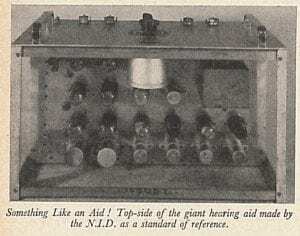 At the time they were in 105 Gower Street, and did not have facilities, so initially UCL helped out, and Dennis Butler Fry (1907-84) led the efforts to establish testing to show the ‘technical characteristics and qualities of the various hearing aids’ which were available, and then publish this scientific information to the public (Denes & Fry p.304). Fry was born on the 3rd of November, 1907, in Stockbridge, Hampshire, son of Fred Cornelius Fry and Jane Ann Butler. 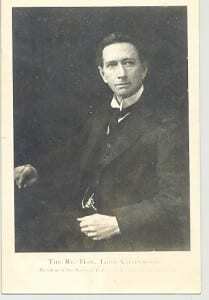 The 1947 annual report records that with the co-operation of Sir David Pye, UCL provost and mechanical engineer who worked on jet engines during the war, they were setting up a special sound-proof room, and that technical staff would be trained at the college, all under the supervision of Fry. Fry had served in the RAF during the war, at the Acoustics Research Laboratory, Central Medical Establishment, at Kelvin House, 24-32 Cleveland Street, London. 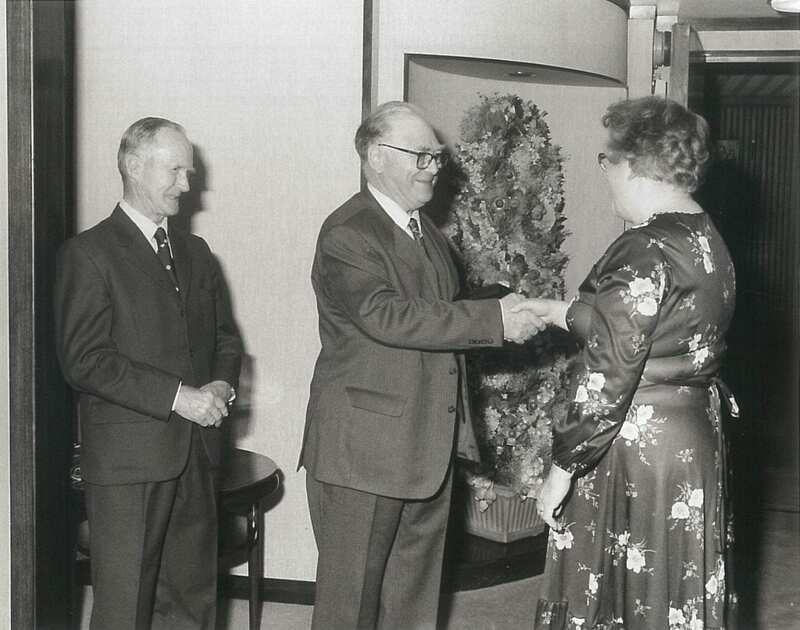 Together with his colleague Péter B. Dénes (1920-96), a Hungarian phonetician who became a British citizen, but spent much of his later working life in the USA. The books of Fry and Dénes (usually written Denes) on phonetics are still in use today. Fry founded the journal Speech and Language in 1958. He wrote two books with Edith Whetnall (they are pictured together below), The Deaf Child, and Learning to Hear. Although Hungarian by birth, Peter was very much British by citizenship and personality. His knowledge of European history and views on events in America led to many lively discussions with his many friends and colleagues. 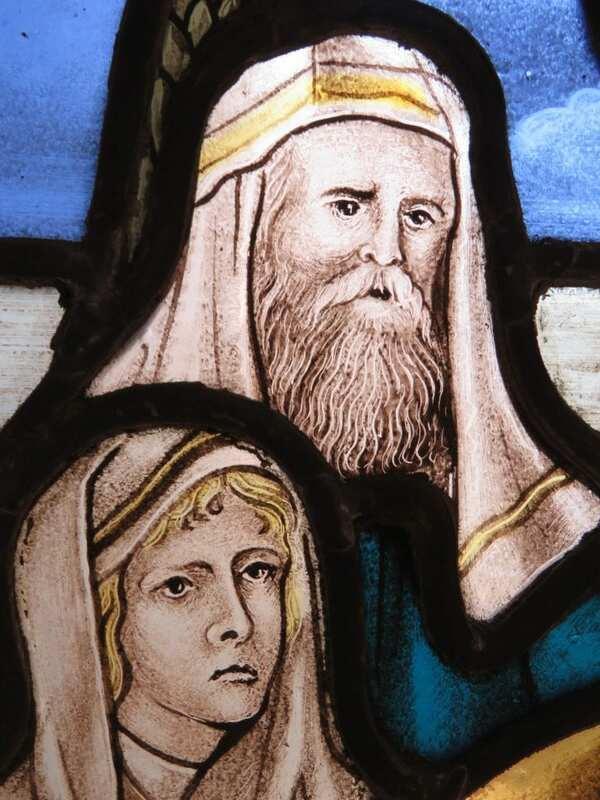 Peter chose to remain a subject of the Queen of England, but he also chose to live in the United States. 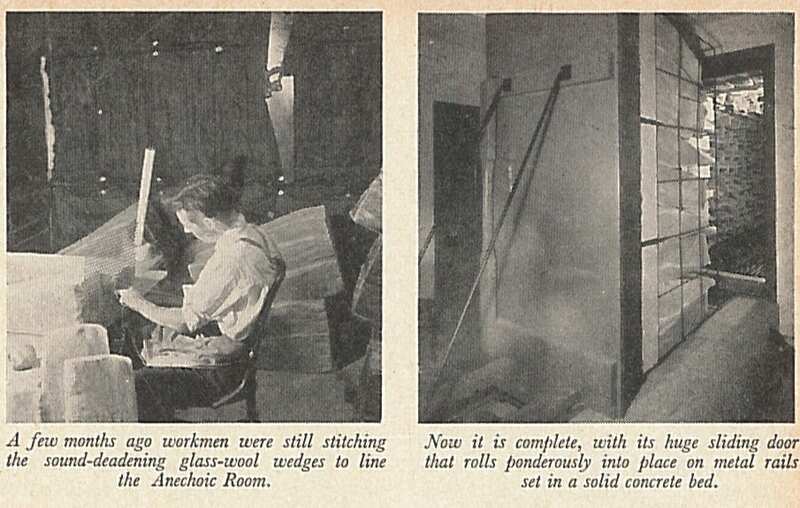 The room in the basement of 105 was eventually fitted out for technical testing, along with the anechoic chamber. In those days the road traffic would not have been as bad as now, and I suspect it would not have been possible to use it today, because of vibrations. The first technician seems to have been Mr W.J. Markwick, who is mentioned in the 1950 annual report (p.33). The Technical department became one of the most important areas for the NID in the following decade. I am sure this would be an interesting area for research. Denes and Fry were both interesting people who made significant contributions to speech and language research. Lord CHARNWOOD (1864-1945), was born Godfrey Rathbone Dawson in Hampshire in 1864. He was the son of a Hampshire barrister of Quaker stock. One of his brothers Sir Francis Benson became a noted Shakesperean actor, while the eldest brother was the great arts and Crafts designer, William Benson. I have two things that ought to be said about the deaf. Their misfortune is not one that instantly appeals to sympathy. Everyone sympathises with the blind. You do not instantly discover that the deaf are deaf. I confess frankly myself, that my inclination is to be irritated with the person who is deaf. It is not sufficiently appreciated that a person who is deaf from birth or from a very early period of life is really shut out, at any rate from the earliest and most important years of life, from the improvements of mental development which are open to the rest of us, even to the blind. Though admirable work is done in many parts of the country, there does not exist at this moment anything like a central national organisation charged with looking after the general interests and welfare of the deaf. Charnwood was a Liberal MP for a few years, then was called to the bar. He was deeply interested in Church affairs. “His own personal views on religion were set out in a very candid study of St John’s gospel, According to St. John (1926), and, in revised form, in A Personal Conviction (1928)” (Oxford DNB). He also wrote a highly acclaimed biography of Abraham Lincoln.